The Port Phillip & Westernport Catchment Management Authority (PPWCMA) today held an event to announce the mid-project findings from a two year trial of compost applications under grape vines at three vineyards on the Mornington Peninsula. The trial was funded through the Australian Government’s National Landcare Programme and was run in conjunction with the Western Port Catchment Landcare Network, the Mornington Peninsula Vignerons Association and the Australian Organics Recycling Association. The aim was to assess whether the application of compost mulch under vines would reduce weed densities and herbicide use, improve water use efficiency and soil health and reduce vine stress on extreme heat days. The results of the trial were definitive. During periods of heat, the control rows had limited biological activity and a significant decrease in irrigation infiltration, whilst the test rows using compost showed more efficient infiltration and did not require night irrigation. Alternatively during the wetter months, the compost test rows also showed positive results. This was first evident during a significant rainfall event in the last week of April 2015. All rows became waterlogged, however after 24 hours, the compost rows began to dry out, whilst the control row remained waterlogged for over a week. This resulted in a decline in biological activity and plant health as a result of the waterlogging. Joe Vaughn from 100Hunts Vineyard in Tuerong hosted one of the trial sites. He noted that using compost mulch on his vines over the past two years has resulted in a 50% decrease in herbicide use due to less weed pressure. 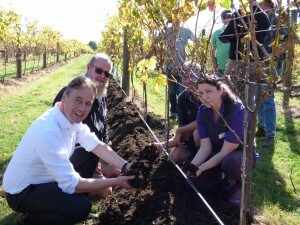 “The number of vineyards on the Mornington Peninsula using compost mulch on their vines has risen over 50% in the last 12 months. This is a fantastic outcome and will result in more productive and efficient vineyards across the region”, he said. The results day was attended by more than 65 landholders from the Mornington Peninsula, Yarra Valley and Goulburn Valley fruit growing regions, as well as students from RMIT University. For further information on the trial, contact Karen Thomas at the PPWCMA on 03 8781 7900.